Enter the word “donate” into the Event Name or Event ID prompt. The search results will list the option to donate to Graduate NYC. 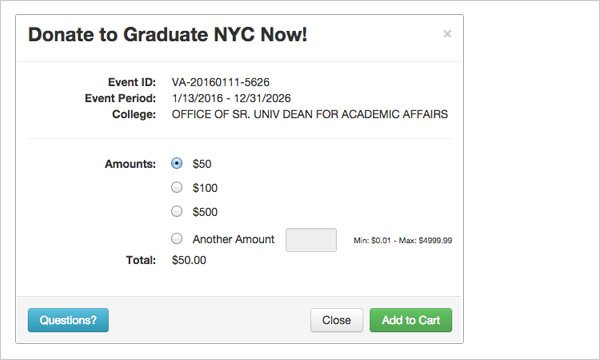 Select or manually enter the amount you wish to donate to Graduate NYC and Add to Cart. Follow the on-screen directions to Pay Now and complete your transaction. Thank you for your support! Please note that a processing, fee based on payment amount, will be charged. This fee will be refunded in full within a week of your donation.